Trainer Henry de Bromhead was delighted that Identity Thief's victory justified the decision to move him up in distance to three miles. The Kayf Tara eight-year-old, who is owned by Ryanair's chief executive Michael O'Leary's Gigginstown House Stud, was fourth in the Unibet Champion Hurdle at Cheltenham on his last outing. He was a 14/1 shot today under Sean Flanagan, and beat Wholestone by five lengths. The 6/5 favourite, Sam Spinner, finished third. De Bromhead said: "You have to stay, and we just didn't know whether he did or not. It was Sean's plan, he said he'd love to go three miles, and we said we'd leave him to ride him how he wanted to ride him. Fair play to Sean - it was his suggestion. "We came here for the two and a half mile race [the Betway Aintree Hurdle, where he finished last of six] here last year and rode him positively, and he was disappointing on the day. And then the way he ran in the Champion Hurdle - he sort of stopped midway and then ran on again really well at the end, so we just hoped that the big step up would suit him, and it has. "We always thought he was a good horse. He won the Fighting Fifth Hurdle at Newcastle, and then rather lost his way over fences, so it is great to have him back. And it's a Ryanair race!" Winning jockey Sean Flanagan, registering his first G1 success in Britain, said: "I was very lucky to ride Identity Thief early in the season and it's great that I've been allowed to stay on him. 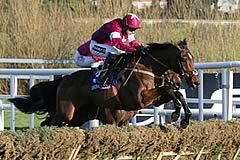 "He ran well in the Champion Hurdle and was staying on at the end of the race and I thought he could get three miles. "He is such a classy horse that he was able to travel nicely and he stayed on well. "I got a few gaps and he jumped his way there - he did it very easily as he is a very classy horse on his day. "He rides like a very good horse over three miles."